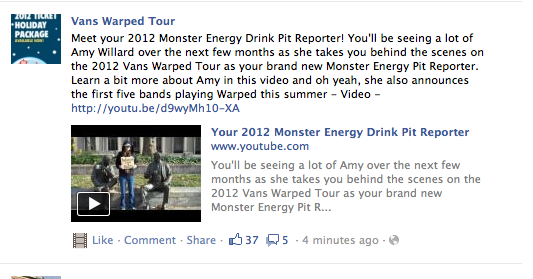 It's been a while, but today was no ordinary day... Out of hundreds of applicants, I was chosen to be the official Monster Energy Pit Reporter for the 2012 Vans Warped Tour! I am so honored and so excited to hit the road next summer and document the experience! Here's my audition video that caught the Warped Tour team's eye! and here is my official announcement video from today!